We had a great conference in Denver connecting with practice managers, marketers, administrators, physicians, and other members of the fertility industry who are helping women preserve their fertility all across the globe. Didn’t get the chance to connect with us in Denver? 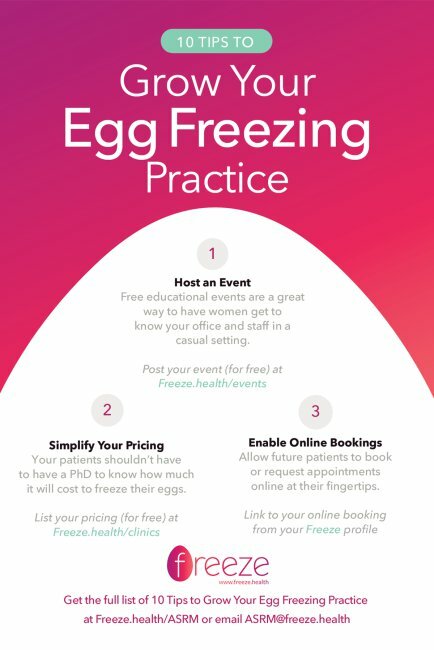 You can still learn how leading clinics are growing their egg freezing practices, and what women choosing an egg freezing clinic want to know. I consent to receive email communication from Freeze, but can unsubscribe at any time. Don’t see it in your inbox? You can also email asrm@freeze.health and we’ll respond with the PDF. Want to talk further? Shoot us a note to set up a time to chat with our team.